Actually I am quite surprised that my younger gal is having a school break today. I thought Youth Day was only meant for secondary school kids. Memory is definitely fading fast these days. Today I decided to try a new recipe. I tried making French crepes before but I was curious how a Japanese crepe taste like (Rice crepe). I was a little heavy handed with the batter and ended up with a thick crepe but I make up by using Durian cream. I will definitely retry this recipe for I believe it is even better if it is thinner. BTW, I am organising a blogger's get together. If you are keen, kindly leave me a comment over here. Am targetting this event to be in end July. Sorry, the event is fully taken up. Invitation closed. Mix all ingredients together till you get a smooth paste. Let it rest for 5 mins. 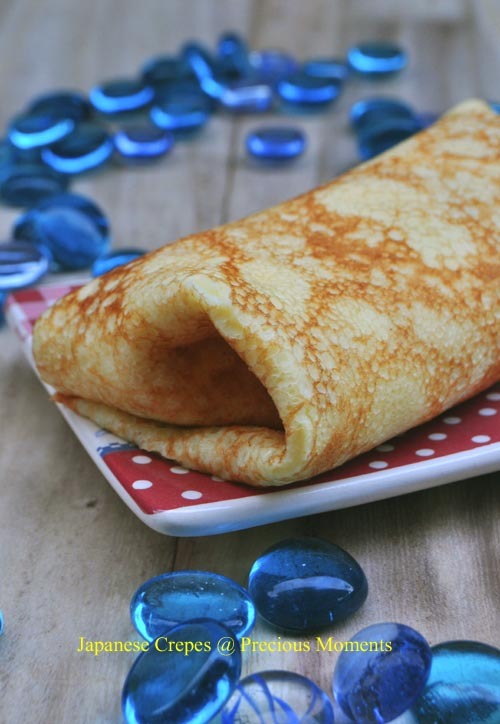 Heat a shallow pan with butter, pour half a ladle of batter to form a thin crepe. Cook till it turn brown and flip to the other side and continue cooking. 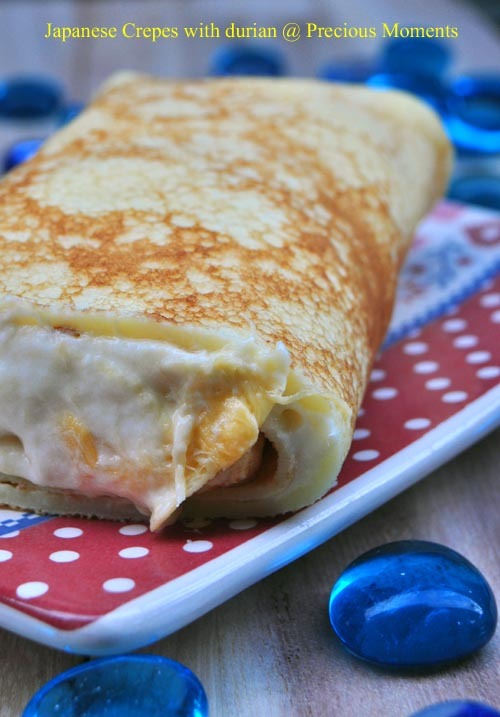 Dress your crepes with your favourite fillings. Hi Edith, I like this version of crepes with durian cream too. Btw if you like those Argywood leaves, I can send you some. I sometimes pick more and sun-dried them for later use. Do email me if you are interested. My email is sdpui@yahoo.com. i dont even know there's a japanese version of crepes, will need to google and find out! Thanks for your comment in my blog. I loves to eat pancakes and crepes and I am trying to make crepes very soon too. We adore both thin and fluffy pancakes. Yours with durian cream sounds heavenly. Hi Mui Mui, sorry for the delayed response as I was ill. So coincidentally, my aunt managed to get hold of the Argywood leaves when I told her about you and the leaves. So now I am happy to see a pot in my garden but according to her, the uncle who gave her the plant said it was not the true breed type. Leave, yah also first time I came across. Angie, congrats on your book.